So you think nothing grows in the snow? Wind turbines sure do. As people continue to research, new innovations will surface -- and innovation does grow in the snow! According to Science Daily, nearly 50 GW of wind energy will be built in cold climates over the next 5 years, an increase of more than 70% since 2012. Cold climates have denser air and higher winds, making them ideal for wind power. Wind energy capacity is growing rapidly in the cold climates of the world. According to the latest forecasts, between 45 and 50 GW of wind energy will be built in cold climates by 2017, which would mean an increase of as much as 72% since the end of 2012 and investments amounting to approximately €75 billion. "There has been a lot of talk about the potential of offshore wind power, but the market for cold climate wind energy is more than 10 times greater. We already have the tools to harness the potential of cold climate wind energy cost-effectively, while offshore wind energy is still at the research and development stage." - Tomas Wallenius, Research Scientist from VTT Technical Research Centre of Finland. 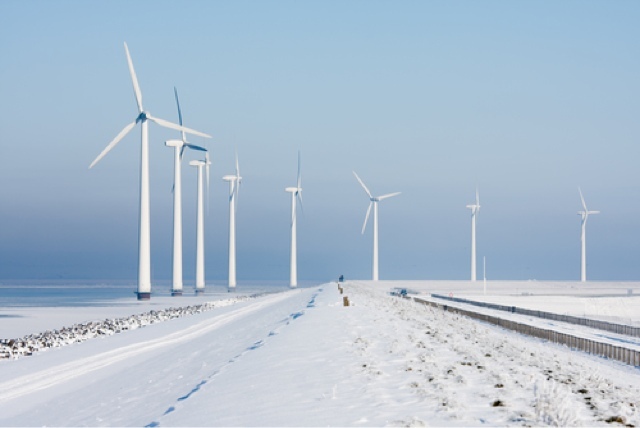 VTT has conducted the first ever study into the feasibility of building wind turbines across the globe in areas where cold climate and icy conditions place special demands on wind turbine technology. In addition to Scandinavia and Canada, these areas also include parts of Central Europe, the United States and China. The VTT study has been incorporated into the BTM World Market Update 2012 report (Navigant Research 2013). Cold climates represent encouraging potential for wind energy companies because of their sparse population and favourable wind conditions. These areas experience higher winds in winter than in summer, and the density of cold air increases production capacity. However, turbine blades are highly susceptible to icing. Although icing causes production losses of 3-10 per cent per year, losses can be reduced with the help of anti-icing systems. Rasanya tak sesuai. A wind speed of 5m/s to 15m/s is required to turn the turbines. Angin tdk cukup kelajuan di kawasan tanaman padi kita.